What Is It? is something you should read. One of the interesting items in the collection at the Civilian Conservation Corps Museum of South Dakota is the Backpack Water Fire Extinguisher. Visitors to the museum often ask "what is that thing" and it's easy to see why. A CCC Boy may have to carry that thing full of water for some distance to engage in the battle with a forest fire. Thank you to the Forest History Society, Durham, NC for allowing us to share their April 3, 1940 photo by photographer Leland J. Prater. The photo (below) is of a CCC enrollee from Tell City CCC Camp (Indiana) spraying water from backpack pump at fire in a dead Chestnut snag. 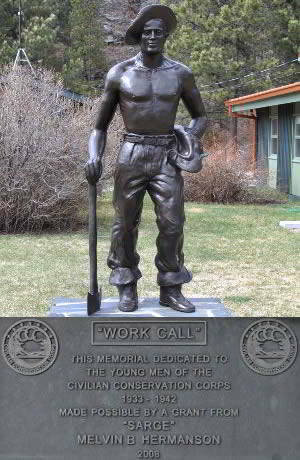 If anyone has a photo of a CCC Boy from South Dakota with a Backpack Water Fire Extinguisher, please bring it or send a copy to us. One of the interesting items in the collection at the Civilian Conservation Corps Museum of South Dakota is the Backpack Water Fire Extinguisher.